Women’s basketball is expected to finish sixth this season according to this year’s Northeast Conference Coaches Poll. Last season, the Terriers were 11-19 overall and 8-10 in NEC play. “We turned it around, moved up the standings, won some more games. But on the inside, we knew that we could be better,” said Head Coach John Thurston. “Last year was last year. Everyone’s a year older,” said Thurston. “Sixth is good, but that’s not where we want to finish. 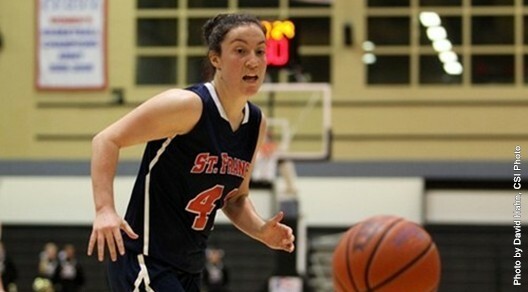 We want to finish a lot higher than that,” said junior guard, Eilidh Simpson. Last year, the Terriers were tied for second place out of 345 school for highest overall team grade point average. At the end of last season, the Terriers had to say goodbye to their only senior, Stefanie Bingham. The newest freshman on the women’s team is Olivia Levey of Seymour, Connecticut. Levey is a six-foot forward, who played for Lauralton Hall High School, earned two Most Valuable Player awards. The Terriers have 12 veteran players, as well as Katie Fox and Jasmin Robinson. They will return as the teams main point guards. Simpson, Leah Fechko and Ozana Marginean return as guards for the Terriers. Jessica Kaufman, Jaymee Veney, Sarah Benedetti and Casey Cummings are back this season as forwards for the Terriers. Junior Collette Hounshell will be back on the court as a forward after an ankle injury that forced her to red shirt last season. Senior Kiley Grabbe is the only returning center for the women’s team. The Terriers open their season at the University of Pennsylvania on Nov. 9, 2013. Their home opening game is on Nov. 11, 2013 against Army at 7 pm.